The taco has traditionally been a humble food, originally created to make small amounts of meat go a long way. 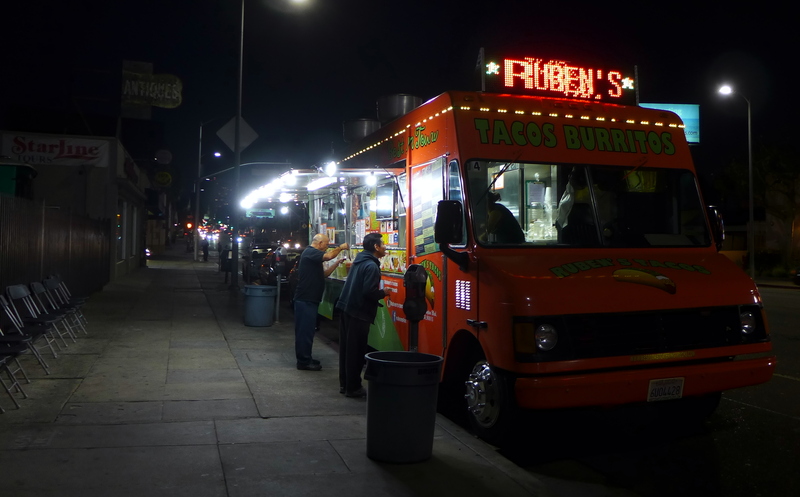 In the past couple of years, however, this has been changing, at least in Los Angeles, where serious chefs have been designing seriously delicious upscale tacos to a well-heeled clientele. One of the newer entries if B.S. Taqueria on 7th Street downtown. I thought it would be a good idea to start with an old standard that you can get in any taquería – Carnitas – and it was a wonderful surprise. 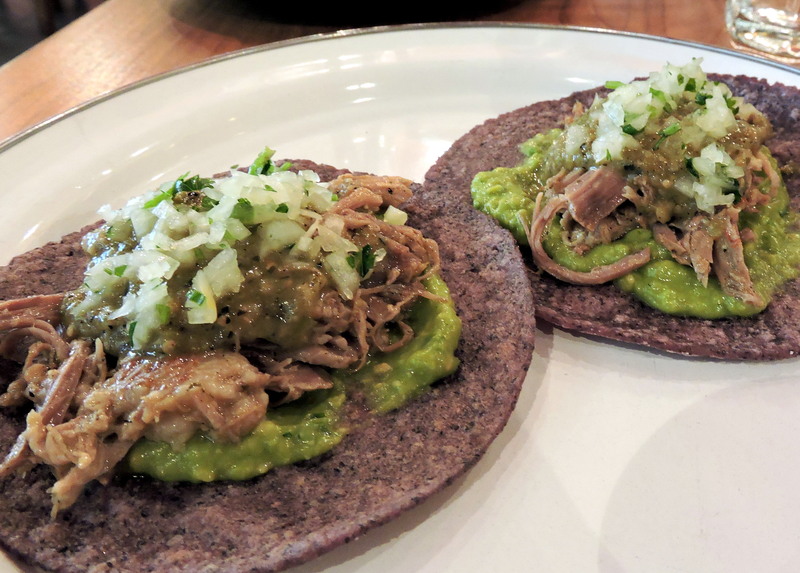 Served on a blue corn tortilla and a base of guacamole, the perfectly braised pork was brought to life by a lime-heavy salsa verde and finely chopped onion and cilantro… Not your father’s carnitas! 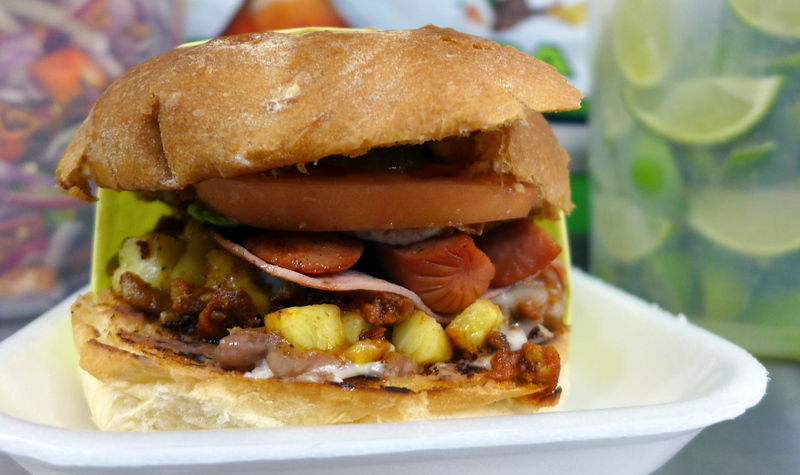 The taco that really caught my interest was the Chorizo and Papas, sausage and potato. It came on the same blue corn tortilla, but this time topped with a crust of grilled cheese. The chorizo, finely ground, was mixed with a rich red sauce, and the smashed potato was soft and comforting. A dash of crumbled cotija cheese put it over the top. I’m pretty sure I’ve never spent $20 on tacos before, even in my crazy over-indulgences at El Huequito in Mexico City, but this is serious food in an upscale location (site of the sadly missed Mo-Chica) and it’s high time that tacos stood up to be counted as the truly great food that they can be. When a couple of serious chefs opened a taco restaurant, the results were wonderful. Tacos Punta Cabras serves some of the best and most interesting tacos in Los Angeles from their small space in Santa Monica. When I heard they had opened a Mexican “burger joint,” I just had to head downtown to see what was going on. 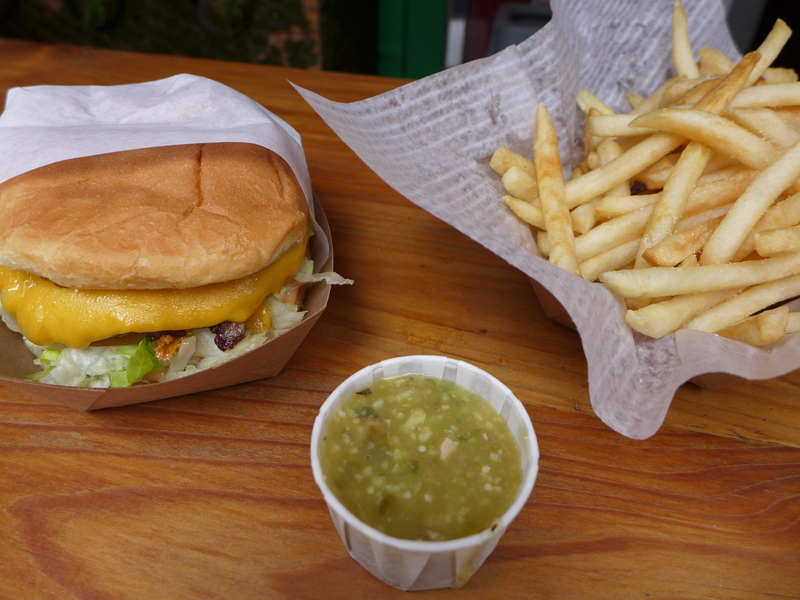 What I found was just that – a hole in the wall burger joint that looks like something you might have seen in East LA in 1963. The main attraction is an old-school burger with none of the hipster frills we’ve been seeing in recent years… Well, I don’t recall having home-made thousand island, excuse me… mil islas on my burgers in 1963. The difference, though, is that it’s the best old-school burger you’ve ever had. Top quality ingredients, perfectly executed, and served in a traditional paper sleeve. And the bacon tomatillo salsa was a terrific modern touch. That’s where old-school ends, though. The menu also has black bean burgers and turkey burgers, which I may try on another visit. 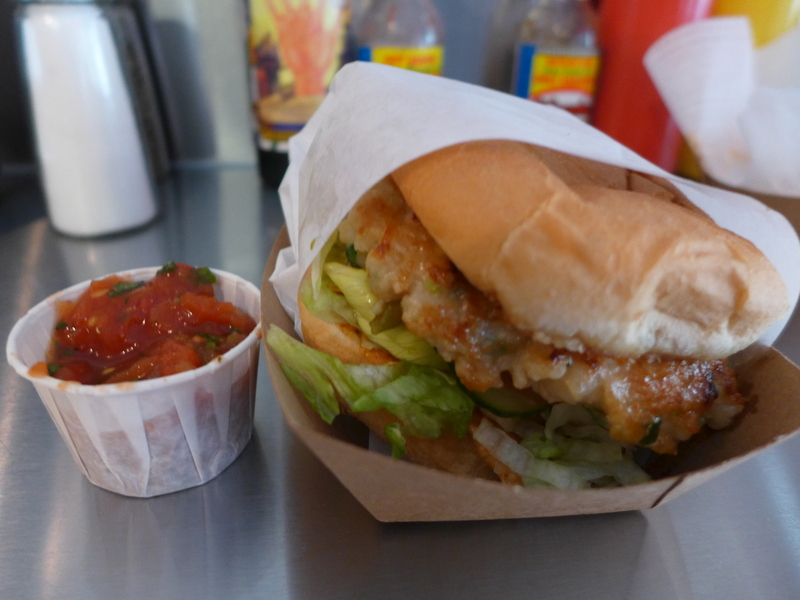 What I did try (yes, I had 2 lunches yesterday) was the shrimp burger. This is where the chefs’ creativity came in full force. A combination of ground shrimp and pork, I was having flashbacks to delicious Vietnamese meals. Served as a burger, though, they had some fun with Mexican spices and Asian flavors, including paper-thin slices of my favorite Asian pickles. I will definitely be going back for more of these. 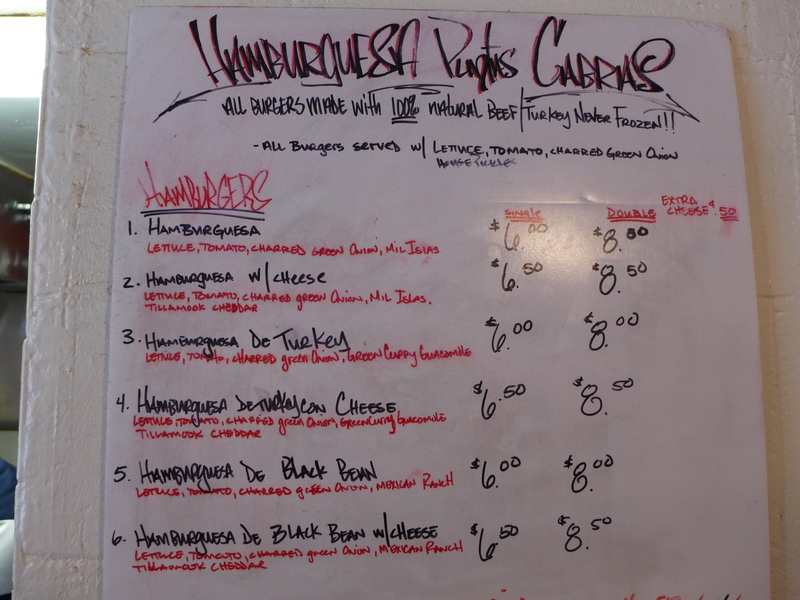 Hamburguesas Punta Cabras is on Spring Street near 7th. About 10 years ago, I did a double-take when I read an article in the Los Angeles Times about Chichén Itzá’s tacos de venado. 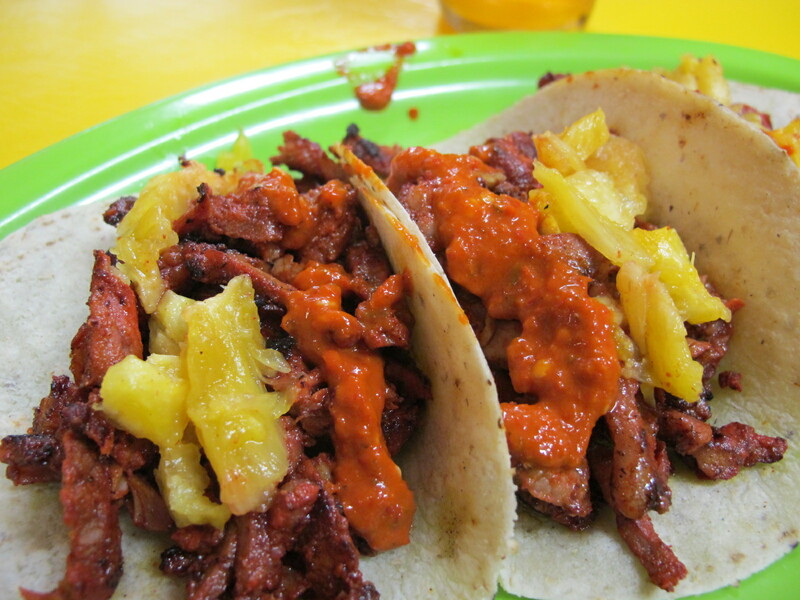 How could a Yucatán style restaurant be more authentic if it served deer tacos? I don’t think they’re on the menu any more (they were wonderful, by the way), but I’ve been back many times since, to explore the consistently delicious regional cooking. This afternoon, I was invited to a preview of AltaMed’s signature fund-raising event East L.A. Meets Napa. Owner Gilberto Cetina gave us a tour of the Mercado where the restaurant is located, and presented some of the highlights of the menu, as well as some interesting stories about Yucatán cuisine. I learned, for example, that Queso de Bola is actually Edam cheese that was introduced to the region by Dutch, uh… Pirates of the Caribbean. The highlights today were the Panuchos. 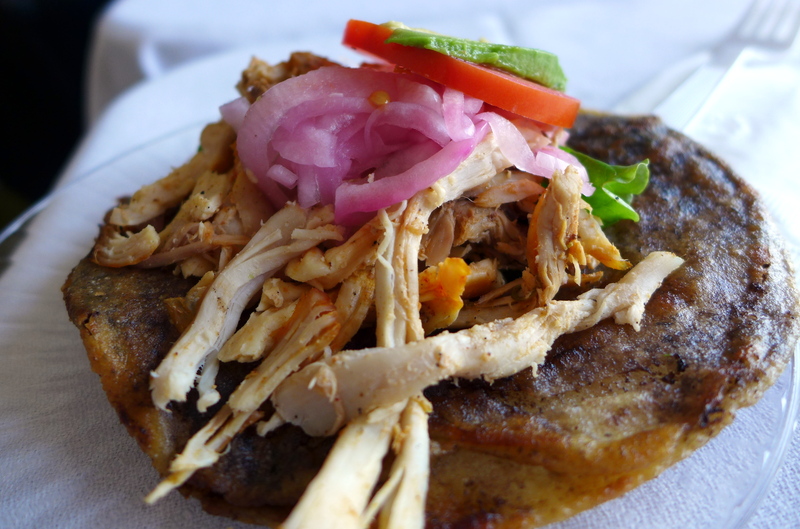 Unlike many Yucatán dishes, panuchos do not date back to the Mayans, but are a more recent, although still traditional concoction. 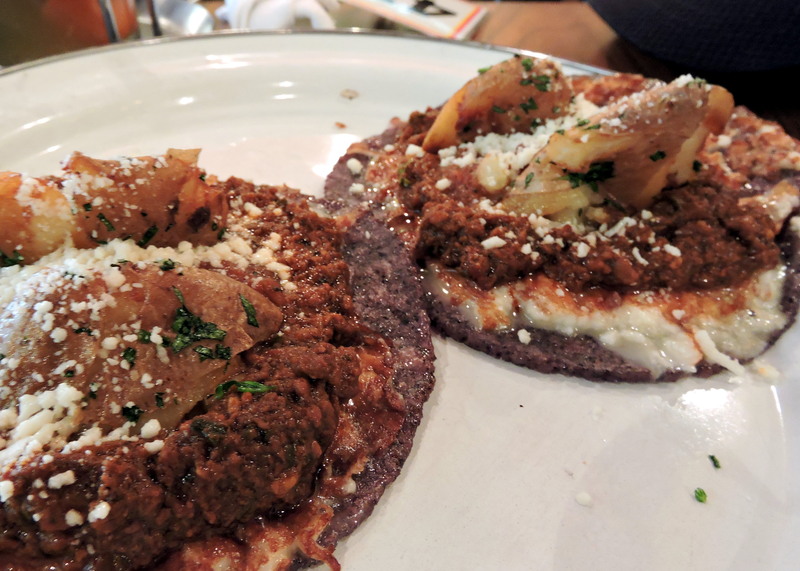 The foundation is a tortilla that has been infused with a black bean puree, then fried. The topping is shredded turkey (! ), pickled onion, lettuce, avocado and tomato. My fork didn’t offer much support, so I picked up my panucho (with Gilbero’s approval), folded it like a taco, and went to town. Was it kind of like a taco? Well, yeah.. but it was more substantial and richer than most tacos. Earthy and satisfying in every way. The great news is that Gilberto plans to serve Panuchos at the July 18 East L.A.Meets Napa main event. I’ll be first in line. I don’t tend to think of the 3rd Street Promenade in Santa Monica as a hotbed of great Mexican food, but on my first day off in recent memory, I was drawn back to Lotería Grill. 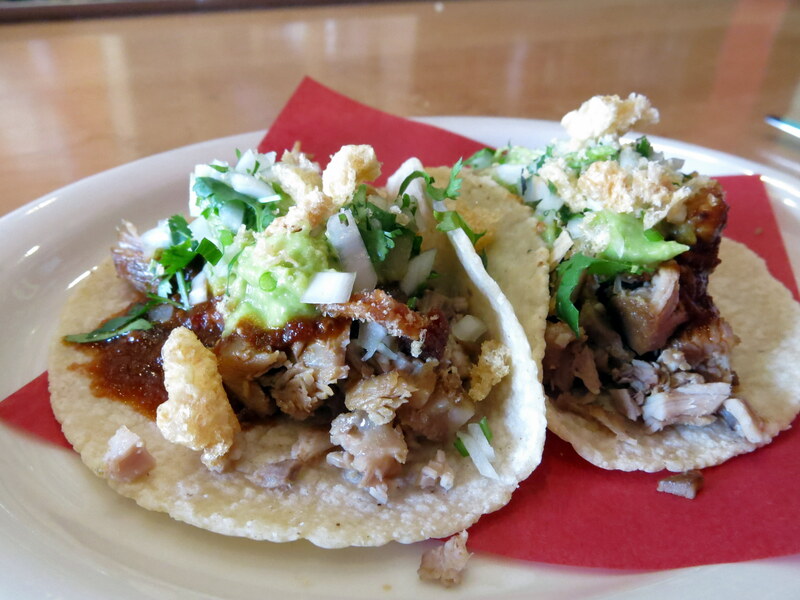 I couldn’t resist the Three Little Pigs tacos – perfectly cooked carnitas with bacon, topped with chicharrón, served on rich, heavy tortillas… and a dash of their signature Morita salsa for good measure. 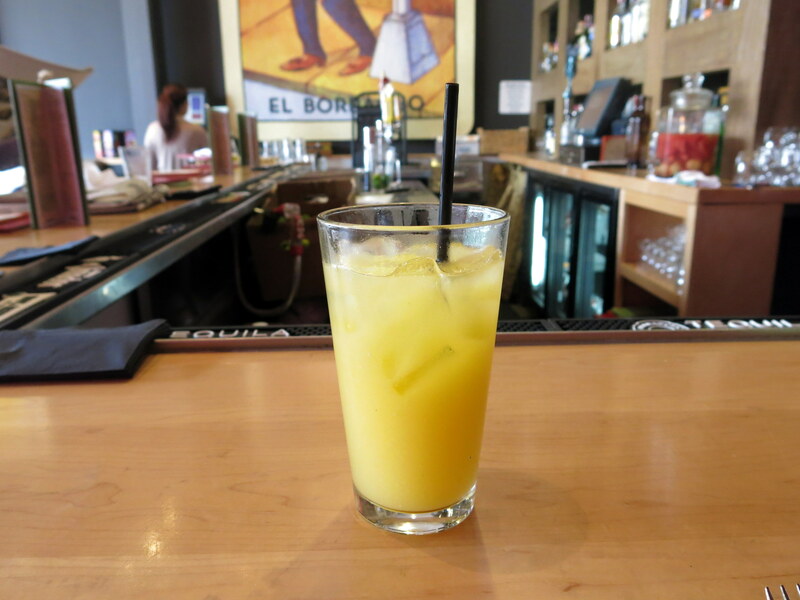 I always ask what the daily agua fresca is, and was delighted to learn it was guava and mango. A tasty light meal well worth the trip. I arrived in downtown Hermosillo in the evening, and the hotel staff weren’t very helpful when it came to restaurant recommendations. I struck out on my own in a nice residential area, and found a lovely park, one of many in Hermosillo, where the local families were eating. 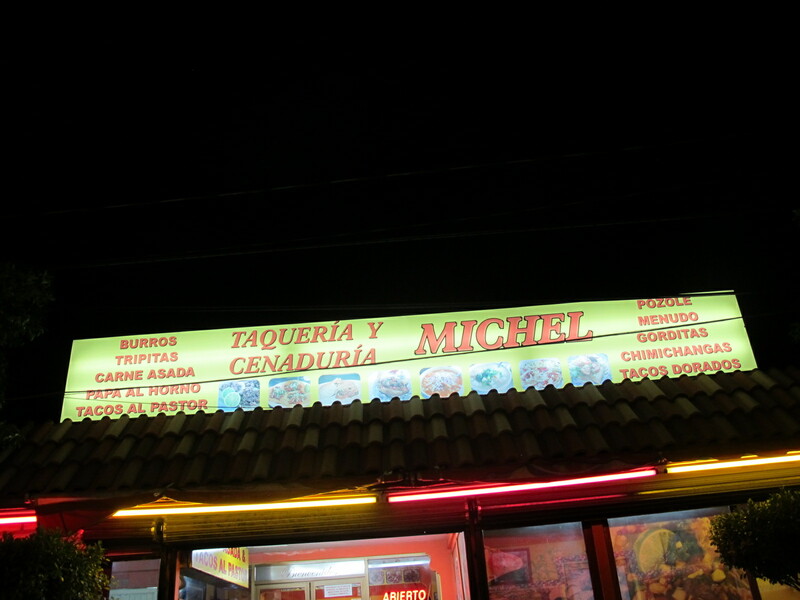 I reluctantly passed up a popular hotdog stand in favor of tacos at Taquería Michel. Every place has its own versions of this popular dish. It’s always spicy marinated pork cooked like shawerma on a vertical grill, often with a piece of pineapple on top. But the variations go from there. At Taquería Michel, the tasty meat was sliced generously onto thick tortillas, and I even got slices of the warm, juicy pineapple. There was a self-service bar with a wide range of embellishments, but I try to stay away from unpeeled vegetables like tomato and lettuce when I’m traveling, so I just went for a couple of dollops of hot chile salsa. The spicy flavors, washed down with an orange Fanta soft drink were a perfect light meal on a hot night. 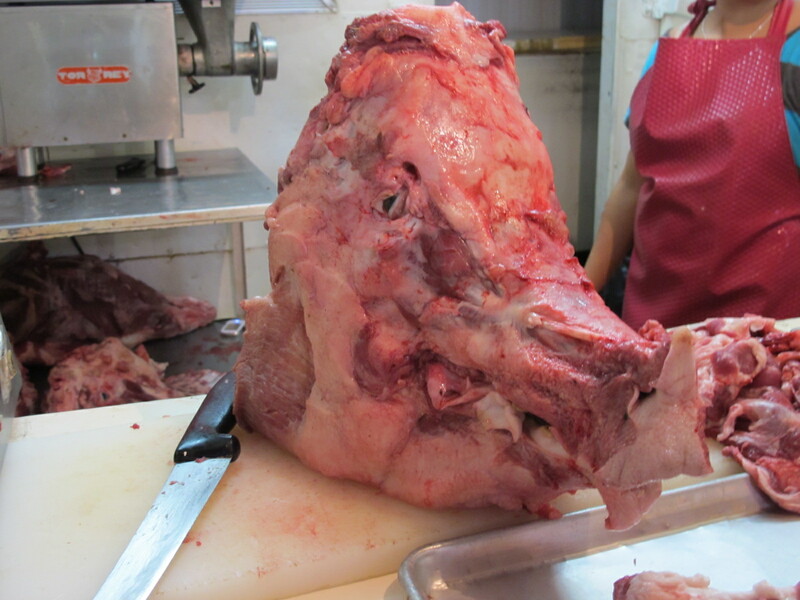 I just started this trip on Thursday, taking buses from Los Angeles to Tijuana, and from there to Hermosillo, and I’ve had a surprising number of invitations to eat the heads (cabezas) of various animals. 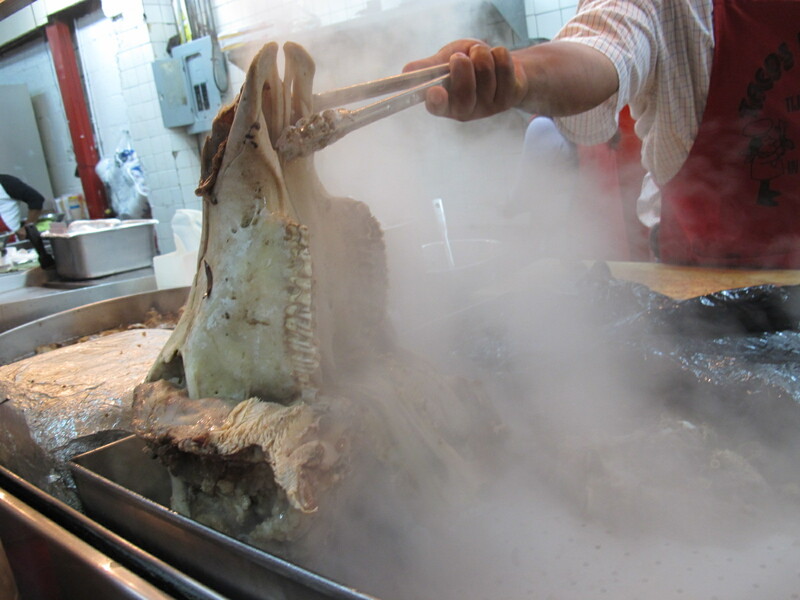 The picture of the steaming skull is from my favorite taquería in Tijuana, Tacos El Gordo. 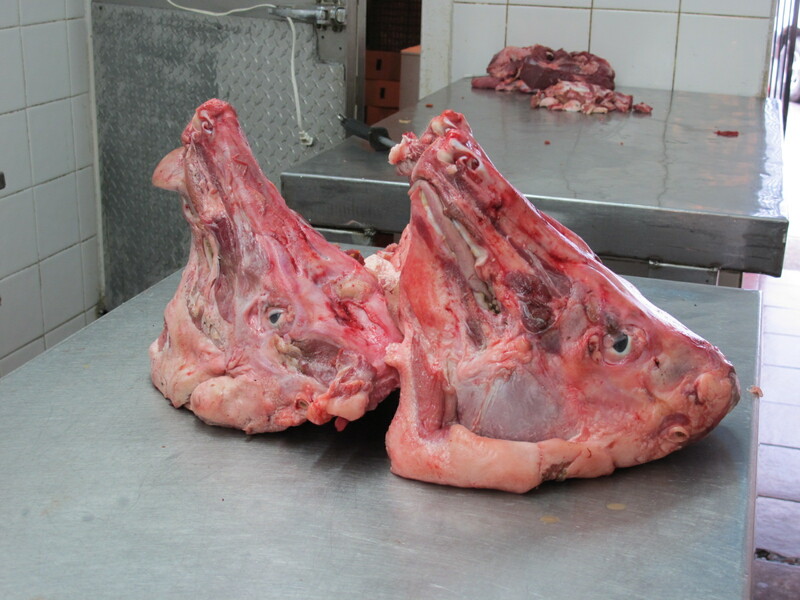 The others are from the Mercado Municipal in Hermosillo. 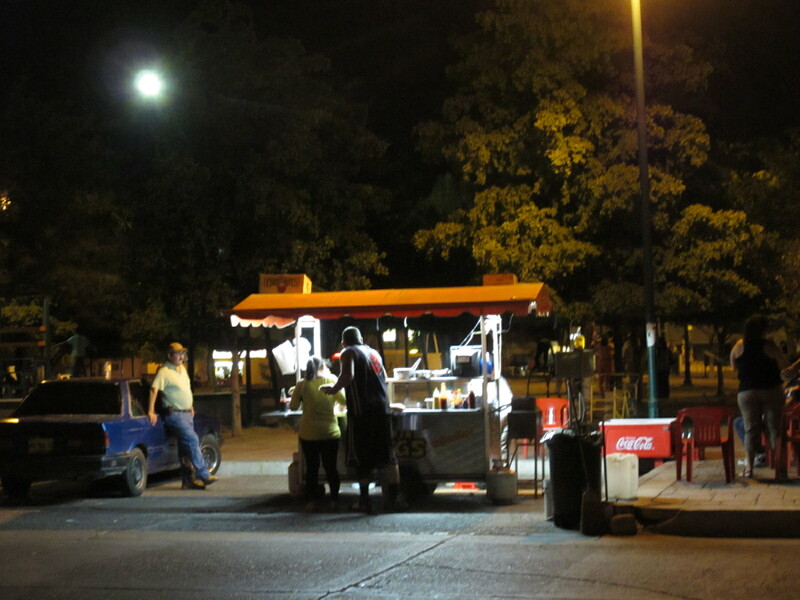 Each time I passed a food stand, they tried to lure me in for breakfast with their delicious cabeza… So far, I’ve managed to resist the temptation.